Therapeutic cervical pillow with fillable water bladder. Provides outstanding comfort and support for the head and neck. Instantly adjusts to changes in sleeping position. Reduces neck pain, relieves associated headaches, improves quality of sleep. Thermal insulator fully encases the water layer to prevent body heat from being drawn from the head, neck and shoulders. Super-soft, hypoallergenic DuPont polyester fiber top layer. Fill with tap water. Personalize for soft, medium and firm support. Can the top layer be washed? If so how? The manufacturer states the pillow can be washed normally as long as the inside contents are emptied out before washing. I have this pillow for a very long time. I would like to freshen it up. can it be washer and if so, how? This item is machine washable, according to the manufacturer. i would like to know if they come in king size ? We may be able to special order that size for you. Please give us a call at your convenience and we can put together a quote for you if the item is available for ordering. Outstanding product------shipping leaves a lot to be desired. The product is superior.....BUT & HOWEVER! I ordered six (6) pillows and to date have only received four (4). I called customer service a week after receiving the partial shipment and was told that the remaining product was probably being shipped from a different warehouse. Acceptable explanation, BUT--it's been over two weeks and I still have not received the remaining product. Payment for a full shipment has been charged to my credit card, would it be possible to receive the full shipment? This is by far the best pillow I have ever owned. 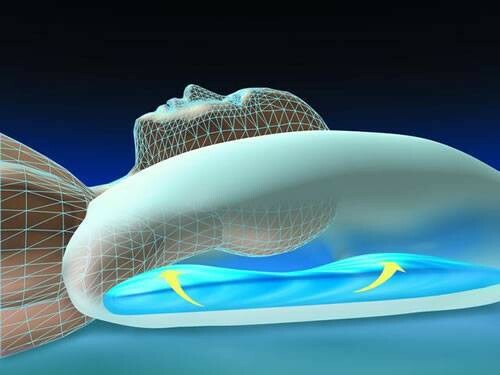 I had brain surgery and could not find a comfortable pillow until I bought the Mediflow Waterbase Pillow.